SUDBURY, ON / ACCESSWIRE / April 9, 2019 / Frontier Lithium Inc. (FL.V) (the "Company) is pleased to announce the results of the first of five diamond drill holes completed on the Spark pegmatite. DDH PL-038-19 was drilled underneath the surface sequence of Channels 33 to 36 (see Figure 1 and 2). The hole was collared in pegmatite and was drilled through 3 significant pegmatite zones totaling 215m of pegmatite averaging 1.4% Li2O. During February 2019, a total of 1,340 metres was drilled in 5 holes on Frontier's newly discovered Spark pegmatite (Table 2). Four holes were drilled from the south at the base of the topographic high hosting the pegmatite. The fifth hole (PL-041-19) was drilled from the north on top of the ridge and was also collared in pegmatite. Figure 1 is a plan map showing the rough surface outline of the Spark pegmatite, location of channels and drill hole traces with geology overlain on detailed imagery of the outcrop area. 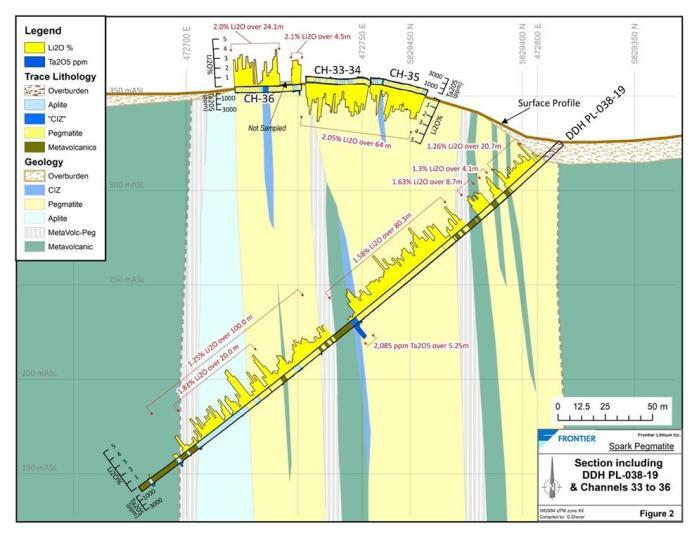 * Assuming the Spark pegmatite is vertically oriented the Horizontal distance equals the "true width" when the Azimuth of the drill hole is perpendicular to the strike of the deposit (070 to 090 degrees). "We are extremely pleased with these initial results and are eagerly looking forward to the results from the remaining 4 holes." commented Garth Drever, Vice President of Exploration. "The drilling and consistency of grades confirm our initial prediction that the Spark pegmatite is vertically emplaced and extensive. The potential for an at-surface resource to augment the PAK deposit on the project is high." Frontier Lithium is a Canadian junior mining company and has the largest land position on the Electric Avenue, Ontario's newly emerging premium lithium-metal district hosted in the Canadian Shield of northwestern Ontario. The Company's objective is to supply 3% of the worlds' lithium demand from Ontario's Electric Avenue by 2025. Frontier is implementing a phased methodology to development for becoming a rare producer of premium technical lithium concentrates required to produce high quality glass and ceramics as well as supplying chemical grade concentrates for the production of lithium chemicals required for the burgeoning lithium battery industry. 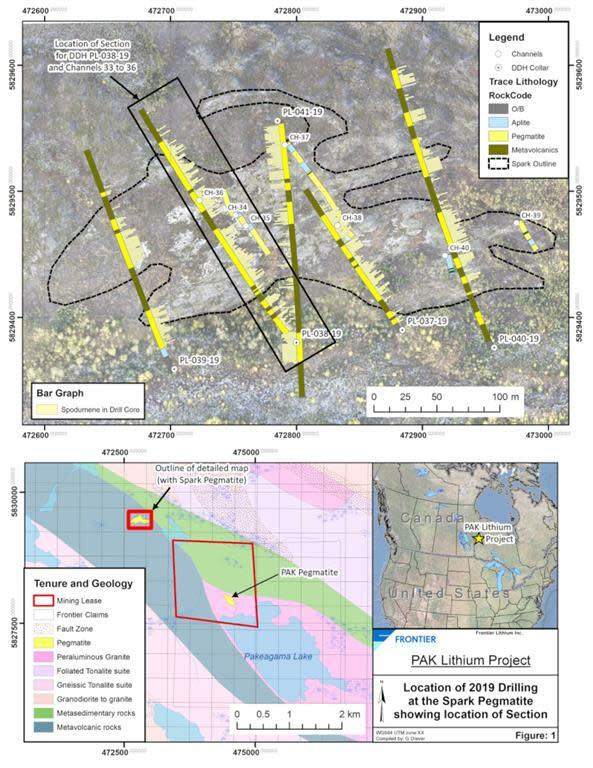 The PAK Deposit is located at the south end of Ontario's Electric Avenue, a newly emerging premium lithium-metal district which also hosts Frontier's new discovery at Spark showing (2km northwest) and the Pennock Lake pegmatite occurrence a further 30km along Frontier's PAK Lithium Project. The PAK deposit has a current Measured and Indicated Resource of 7.5 million tonnes of 2.02% Li2O and an Inferred Lithium Resource of 1.8 million tonnes of 2.10% Li2O which has a rare technical/ceramic grade spodumene with low inherent iron (below 0.1% Fe2O3) as per its NI 43-101 Technical Report, "Preliminary Feasibility Study" disseminated on April 16, 2018.